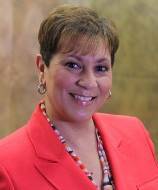 Since 2013, Merlyna Valentine (MEd Educational Administration 2002) has served as Executive Director of Elementary Schools for all elementary schools in her district. Throughout her 30 year career as a teacher and administrator in St. Charles Parish, she has dedicated her life to making a difference in the lives of others and has worked diligently to promote a positive learning environment for all students. She has been honored as Teacher of the Year, Outstanding Educational Leadership Graduate Student, St. Charles Parish Principal of the Year, and Louisiana Regional Principal of the year. On August 17, 2007, Ms. Valentine was faced with a medical tragedy that has changed her life forever. Her love for children and life itself kept her alive as she had one of the closest calls to death imaginable. Ms. Valentine has embraced this tragedy with an extremely positive attitude. She truly believes that this tragedy has allowed her to serve as an inspiration to all to never give up. She has found strength in knowing that ultimately her tragic story can motivate people to embrace change and live life to the fullest. Ms. Valentine was chosen as a "Quiet Hero" by the local news station WWLTV, which featured her on a special news segment. She was also chosen as a "True Saint" by the Sean Payton Show. She has been featured in several articles in the Times Picayune, the St. Charles Herald Guide, and Ebony Magazine as they shared her story of strength, determination, perseverance, and passion for life. In June 2011, Ms. Valentine was featured in a segment on the Today Show in honor of her story of survival, courage, and hope.